Starcraft II is an incredibly popular and strategically interesting real time strategy game. The player gets to command a military outpost, gather resources, build an army and engage in battle. In the process, players make countless decisions in real time like which units and structures to produce and where their army should be positioned. In multiplayer games, the decision making process also involves considering what your opponent has produced. This makes Starcraft II a strategically deep and interesting game that is widely discussed in a variety of forms. Replays of games are commonly recorded and commented. One of the most popular casters is HuskyStarcraft. A more traditional forum-based discussion of strategy can be found at teamliquid.net. Many schools have competitive Starcraft teams, including Cornell. Perhaps most famously, the University of California at Berkeley recently offered a course on “Game Theory with Applications to Starcraft.” In this post, I will analyze some important Starcraft situations using game theory and discuss their strategical implications. Every game, players must decide whether or not to prepare for aerial attacks. Players can train units and structures that attack air units for a small cost. An approximate payoff matrix is shown below. This matrix is similar to the matrix of the matching pennies matrix discussed in class. 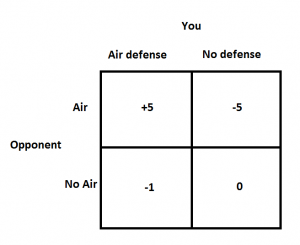 You want to construct air defense only when you opponent makes air units. 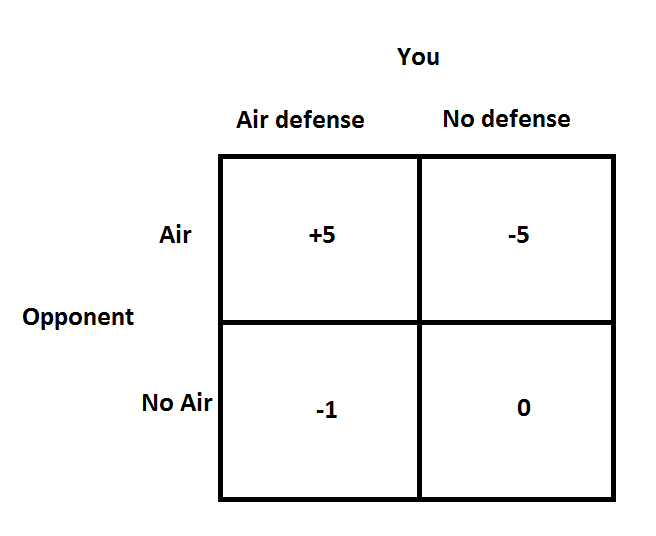 Because there is a much larger swing in payoffs when your opponent goes air units, you will build air defense most of the time in equilibrium. Players must also decide whether or not to build detectors to see potentially devastating cloaked units. 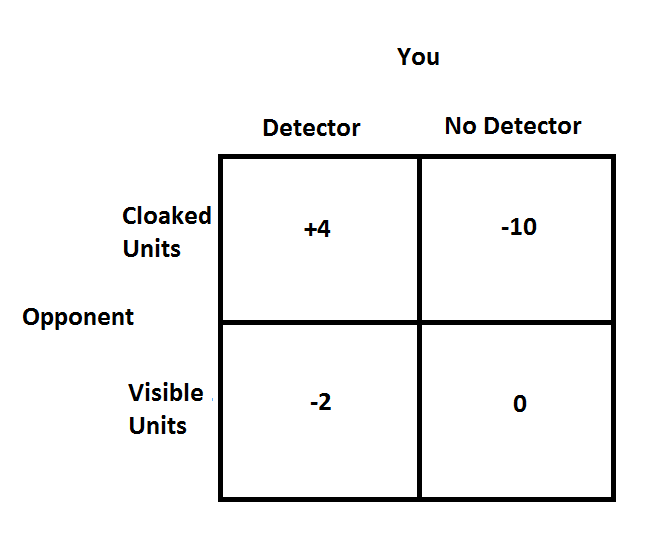 Once again, cloaked units have the potential to be devastating, so players will invest in a detectors most of the time in equilibrium if you don’t know what your opponent is doing. The two above examples show that knowing what tactics your opponent is very useful. For example, if you know that your opponent is going for air but not cloaked units, you can prepare accordingly. Because of this, scouting, or sending a unit to see what your opponent is building, is incredibly useful. Knowing what your opponent is doing lets you make the correct decisions and avoid costly mistakes. The cost of scouting is normally fairly small (around -1 on the graphs above), so it is usually correct to scout if you are unsure of what your opponent is doing. Without scouting, Starcraft would largely be a guessing game. You would choose a tactic and hope that your opponent wasn’t prepared for it. With scouting, the strategies used are very dynamic. If you see that your opponent is going for a certain tactic, you can respond appropriately and gain the upper hand. Your opponent, in turn, will see your response and change tactics. This complex series of responses makes the game very skill intensive and strategically interesting. The best way to execute this is to start with a solid, widely used build and then to make adjustments based on what your opponent does. Better and more experienced players tend to makes better decisions and have better game mechanics than inexperienced players. A veteran player gains incremental advantages by responding to what he sees his opponent doing. Over the course of a longer game, these advantages quickly add up and veteran players almost always beat newer players in drawn out games. Newer players do have a tool they can use to give themselves against more experienced players. They can go for an all-in early attack that guarantees a shorter game, as seen in the matrix below. 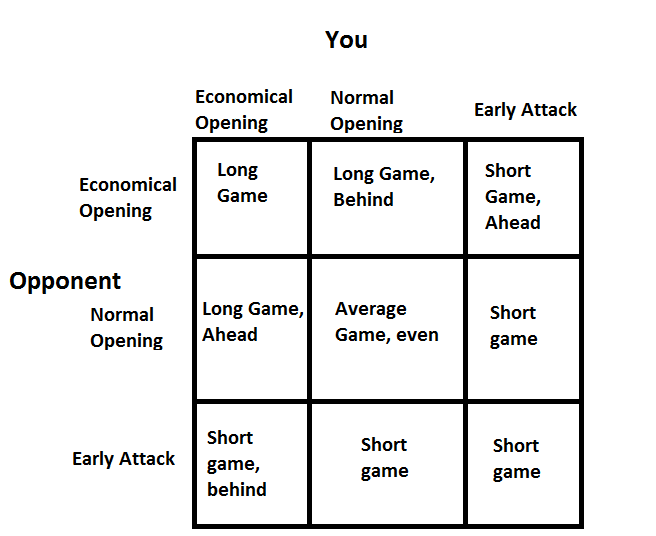 If a relatively inexperienced player gets outclassed in longer games produced by balanced or economical openings, he should focus on early attacks to ensure short, winnable games. 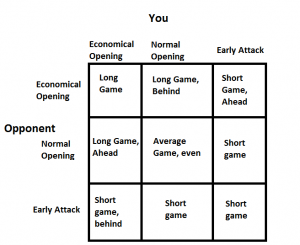 More experienced players should leverage their skill over longer games by preferring economical and balanced openings. Of course, there’s much more to the strategy behind Starcraft II than I could possibly write here, and that’s part of the appeal. Years of practice and theorizing can lead to the ability to make complex decisions in real time. Some people enjoy playing and others enjoy observing the tactics employed by others. Check out the links in the top paragraph if you are interested in further exploring this topic. Very interesting simplification of starcraft! I really love how you have boiled it down something most people can understand. I enjoyed the entire post. Well done!